The field of business administration deals with the application of management principles in business organizations and industries around the world. Business administration professionals are charged with managing resources and personnel, marketing, financial management, supply management and logistics and other administrative duties. Their basic aim is to increase productivity, boost sales, and improve overall profitability in an organization. Business administration professionals also deal with purchasing and acquisitions, project management, labor relations and ensuring that goods and services are provided to consumers on-time and in an efficient way. What is the Master of Business Administration? The MBA or Master of Business Administration degree is one of the most popular graduate degrees, with thousands of new students applying for enrollment every year. This degree starts off with a core curriculum including subjects such as business communications, organizational psychology, resource management, management information systems and strategic planning. Students also take advanced courses in a specialization of their choice, such as marketing, finance, human resources, supply chain management and a number of other fields. Admission requirements for MBA may vary from one institute to another. However, following are some of the major requirements of the degree. Although, coursework for the degree can differ from one institute to another, following are some of the major courses offered in the program. This course enables students to understand different business functions. It also develops an increased awareness in students about their perceptions and values, so they can manage and communicate with others effectively. Other important course topics include decision making, argument construction, teamwork, collaboration, problem solving, and academic research. This is one of the core courses that address the concept of personal development in managers. Students acquire knowledge and skills related to work on job analysis, appraisal systems, and career development plans for employees. Other important course topics include management behaviors, recruitment and selection, training, benefits, workplace diversity, discipline, employee rights, and unions. This course trains students in the legal aspects of business. Students evaluate legal risks and also create proposals to manage organization’s legal aspects. Important course topics include the legal system, enterprise liability, alternative dispute resolution, product liability, business risks, international law, governance, legal forms of business, and intellectual property. This course trains students to apply the acquired leadership principles to different management roles. It will enable them to analyze the connection between the individual and the organization. Major course topics include organizational structure, culture, motivation, group behavior, workplace conflict, and organizational change. This course enables students to apply statistics and probability concepts for business decision making. Students acquire knowledge and skills to develop appropriate research questions and also learn about selecting sampling populations and instruments. The course also includes topics such as descriptive statistics, probability concepts, sampling designs, data collection, and data analysis. This course is geared toward applying finance concepts to management decisions. Students acquire an understanding of methods used for evaluating financial alternatives and creating financial plans. Other key topics include working capital, cash flows, capital budgets, and long term financing. This course trains students to apply marketing concepts that create and grow customer value. Students discuss and solve marketing cases while working in teams. They cover key marketing topics such as market research, customer relations, market segmentation, branding, product development, pricing, communications, and public relations. This course enables students to apply strategic planning concepts to create an unbeatable competitive advantage. Important course topics include environmental scanning, strategic analysis, implementation and evaluation, risk management, and corporate social responsibility. The major responsibility of accountants and auditors is to prepare and examine financial records. They ensure the accuracy of financial records and also check if taxes are paid in a timely manner. They also keep a check on financial operations and make sure that organizations run efficiently. Median Annual Wage: $88,590 in May 2012. Advertising managers are responsible for creating interest in potential buyers in a product or a service, or it could be a whole organization. They generally work in advertizing agencies, media firms, and organizations that require extensive advertising. Median Annual Wage: $99,720 in May 2012. The major tasks of human resource managers are to plan, direct, and coordinate the different managerial functions in an organization. They work on functions such as recruiting, interviewing, training, appraisal, and employee benefits. Human resource managers also serve as a connection between organization’s management and its employees. Median Annual Wage: $78,600 in May 2012. Management analysts are also known as management consultants. They recommend ways to increase the efficiency of an organization. They guide managers on how to make an organization more profitable by reducing costs and increasing revenues. Some management analysts work for particular organizations, while others work on a contractual basis. Q:Which fields of specializations can I choose from while doing a Master in Business Administration? A:There are various specialization options available while pursuing the Master in Business Administration. Here are a few popular ones: Health Care, Marketing, Human Resource, Accounting, General Management, Finance, Entrepreneurship and Project Management. Q:Will there be any difference in the time duration required for the Master Business Administration Degree in different areas of specializations? A:No, there will be no difference in the required time to complete your degree in any area of specialization at the MBA level. All MBA degrees take about 2 years for completion. Q:What are the general admission requirements to get enrolled in the business administration master degree program (MBA)? A:Students interested in enrolling in an MBA program must fulfill the admission requirements of the business school. Normally it is required that students have completed a degree program at a baccalaureate level, and have a minimum CGPA of 2.0. It is also required that students provide letters of recommendation and mention any prior work experience. 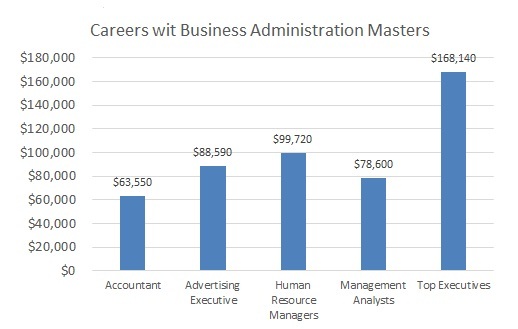 Q:What is a master's in business administration degree? A:A master's degree in business administration is basically a graduate level program that is offered by numerous business schools all over. This degree program is undoubtedly one of the most reputed qualifications globally. The coursework emphasizes on mainly business concepts and strategies, administration techniques, management theories, marketing, and case studies. Q:Are there any general subjects covered in an online masters degree business administration? A:A masters degree in business administration is advanced level program that provides students with in-depth knowledge of the field. In most programs, the first semester of the program focuses on general subjects and introductory areas such as English composition and principles of management. However, the exact course structure will depend upon the institute offering the program. Q:Is it necessary to have a bachelor degree in the same field if I want to enroll in an online Masters In Business Administration? A:It is not necessary to complete a bachelor degree in the same field if you are planning to enroll in masters in business administration. You can complete your bachelor degree in relevant areas. However, it is recommended that you study the same field as it will help you cover subjects in an MBA program. MBA programs are more advanced in nature and comprise of many advanced subjects.